328 sold, only 8 left! Our best-selling Plymouth Mocs ever now in an exciting new style! You've seen quality genuine leather footwear like this selling for three to four time as much. Order from us and save!. 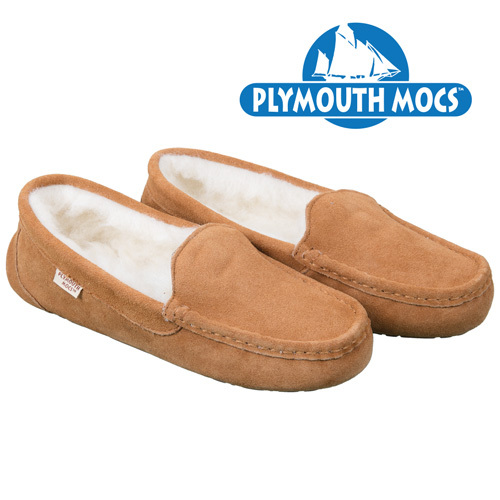 Plymouth Mocs is known for always using the finest quality natural materials. Each pair is painstakingly hand-sewn from genuine suede cowhide and has a 100% natural Merino wool lining that offers natural temperature and moisture regulating properties to keep your feet warm in the winter and cool and dry in the summer. This pair is designed after traditional driving mocs. They have a convenient slip-on styling, hand-stitched vamps and a classic no-frills look. The rugged indoor/outdoor, high-density slip-resistant outsoles are great for running errands or out to get the paper or the mail and will provide years of comfort. Color: Chestnut brown. Womens size 6.